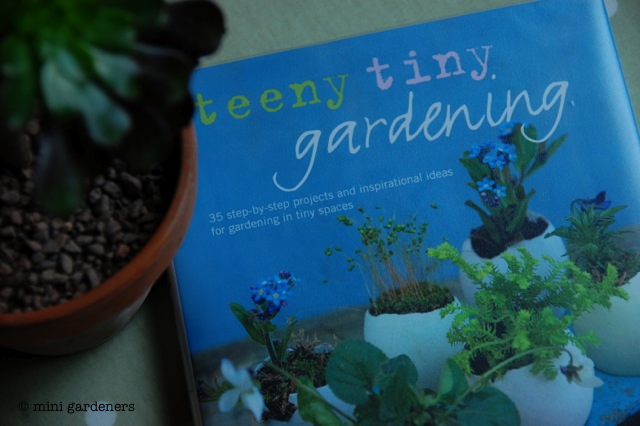 ‘Teeny Tiny Gardening’ by Emma Hardy (published by Cico Books) is not a children’s gardening book but it contains lots of projects that would be perfect for attempting with children. Even if you don’t try any of the projects, the book is a delight to browse with its beautifully styled photographs and clear step-by-step instructions. There’s something very appealing about small, bite-sized gardening projects, giving you the feeling that you could achieve great things before you’ve even finished breakfast. Simple but inspired; a fresh approach to displaying cacti and much more attractive than the usual arrangement of a few random cacti in non-matching pots on a dusty windowsill. 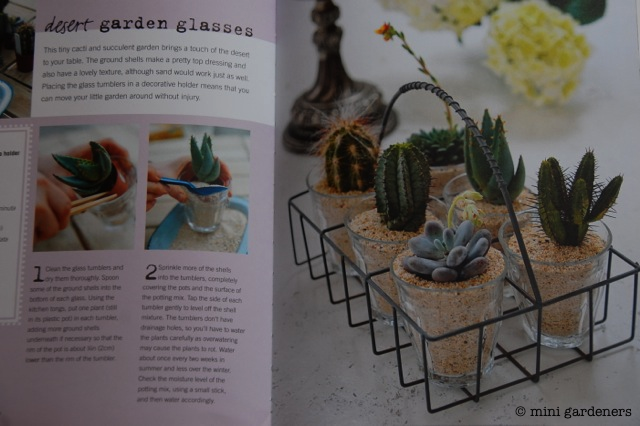 My daughters already have a small collection of cacti each – they’re great plants for children (and adults) who aren’t too good at remembering to water – and displaying them like this will be a simple step. These would also make lovely little gifts. I’ve seen vegetable seedlings growing in guttering before and I really like these painted pieces of guttering attached to the side of a shed. Great if you have limited space and I’m thinking they could also be used for growing lettuce in a school garden. I’ve been toying with the idea of putting a green roof on our garden shed for some time but have been put off by the fact that I’d need to strengthen the shed with internal batons first. And woodwork is not one of my strong points; I nearly cut my finger off in one of the first woodwork lessons at school and things haven’t improved much since then. But the instructions say that only basic woodwork skills are needed and a slightly rough finish adds to the overall charm, so I’m very tempted to give it a go. Watch this space. 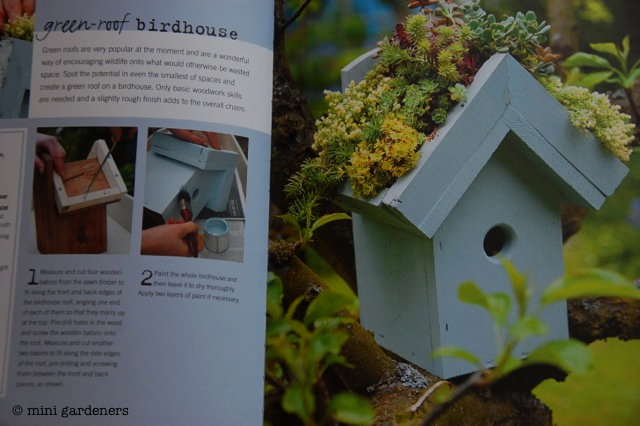 Not all of the projects in the book are to my taste (the planted suitcase and chair for example are a bit too contrived for me and won’t be finding a home in my garden) but with 35 projects there’s something for everyone. Overall a rather charming little book and a big thumbs up from us. 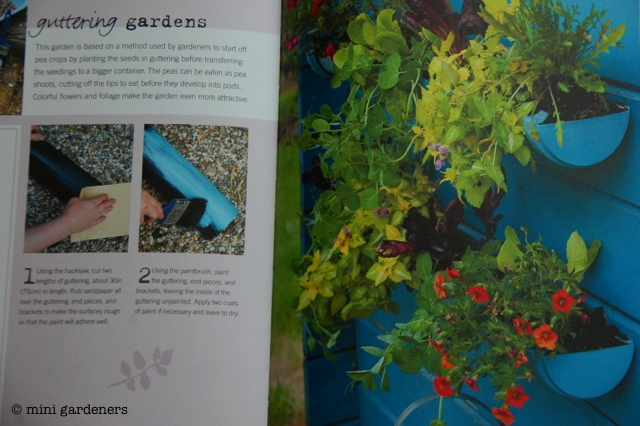 Categories: book reviews, containers and pots, projects, school gardening | Tags: cacti, children, gardening projects for children, guttering, small green roof, teeny tiny gardening | Permalink.